Cozy Slice Of Paradise Just Steps From The Beach!! Charming Newport Beach 2 bedroom 2 bath home located by the world famous Wedge on Peninsula Point. This nicely furnished home provides easy beach access, less than 100 steps away from the sand. Enjoy your morning coffee or evening dinner on the inviting front porch, or entertain privately in the comfortable backyard. Recently updated kitchen has refrigerator, gas stove, oven, microwave, toaster oven, coffee maker, and dishwasher. The living room has a flat screen TV, Apple TV, and DVD player. In the back yard you can enjoy our gas grill, charcoal BBQ, and fire pit. Peninsula Point, in addition to being one of the most desirable neighborhoods in all of Newport Beach, also offers a Bay Beach (which is a short 3 block walk from the house) for those who wish to enjoy the water without the waves. 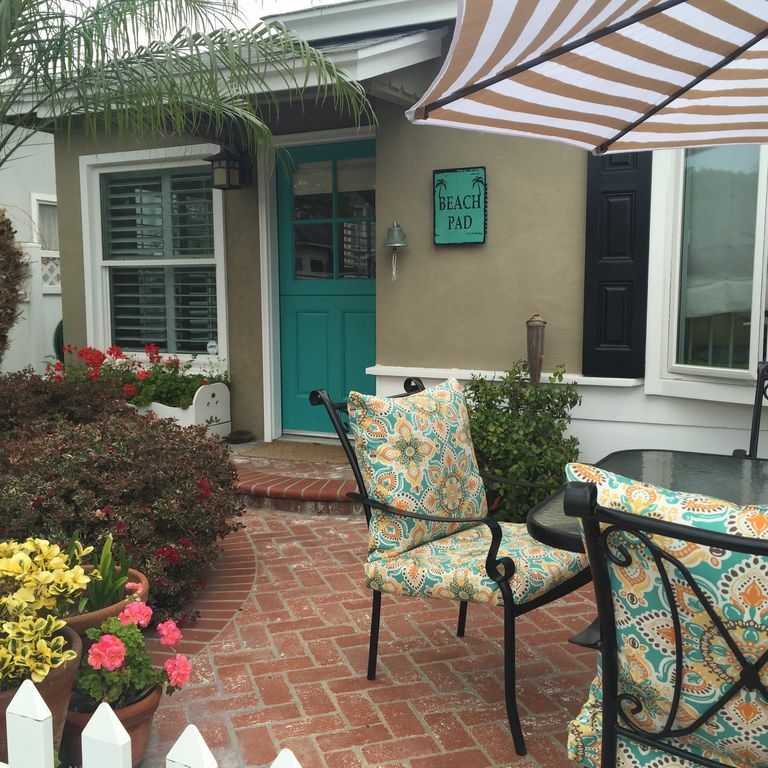 The home is also located only a short walk or bike ride from the Fun Zone where you can rent boats, paddle boards, go on a fishing expedition, take the ferry to Balboa Island, or simply enjoy one of the many restaurants. Perfect location for a perfect vacation! Our family began vacationing in Newport Beach in 1996, when our children were young. We started out on Balboa Island, but then fell in love with the Balboa Peninsula! We've been coming to Newport Beach for 20 years and our (now grown) children have the best memories of riding bikes, jumping in the waves, eating Balboa Bars! We bought this charming cottage in 2005 and hope you enjoy it as much as we do!! Our home has a unique warm and welcoming feel as soon as you walk in the front door!! We are located at the end of the charming Peninsula Point neighborhood. Fabulous spot for a family vacation, or a girl's getaway. Great location for bike riding - you can park your car and not move it for days! Grab your beach chairs and towels - the sand is just steps away. Make sure you take the ferry over to Balboa Island and do a little shopping on Marine Avenue - and a Balboa Bar is a must! We love to grill in the backyard and then enjoy dinner on the front porch - but we always love to go out to the sand for the gorgeous sunsets. One of our favorite things is to sit around the fire pit in the back yard and make s'mores in the summer time. Our family has been coming to this area for 20 years - it's our little slice of paradise!! Master bath has a shower, and the second bathroom has a shower and tub. One block from the sand and one block from The Wedge, known for it's powerful surf. A great place to catch the sunset! We are located one block from the ocean! Grab your chairs and towels and go!! Grab a book and head out to the beach! Beach toys - boogie boards, skim board, paddle ball, volleyball, bocce ball, sand toys, ladder ball. So much to do!! Small grass area in the back yard. Our neighborhood is perfect for biking. Ride to the Fun Zone, the pier, or the grocery store! Most of what you need is accessible by bike. Front porch has a table and seating for 6. Enjoy dining al fresco! Our backyard nook is perfect for your morning coffee. Sit around the fire pit in the evening and make s'mores!! The location of our house makes it perfect for a summer beach vacation, or a quiet winter get away. We are just across the street from the beach. You will love how relaxed you feel as soon as you walk in the front door!! Loved our stay! Feels like home, every detail is taken care of. Kate is a fantastic host. Near the beach in a beautiful, quiet neighborhood. We had such an awesome time at this house. It was clean, had comfortable beds and everything you could possibly need. The air conditioning worked great and one day we just opened the windows to let the air in and that was great too. We enjoyed the wagon, beach chairs and sand toys for our little ones at the beach. The location was awesome with only a few steps to the beach. We always had a place to park in front of the house. We loved staying here and I was sad we couldn’t stay a few more days. You won’t be disappointed with this house! The owner Kate is wonderful. She is truly interested in her guests and does everything she can to make them feel welcome in her home. We would definitely go back again and again to enjoy her hospitality. This beach house is one of the best places we have ever stayed in California. The owner has taken your every wish into account, from perfectly clean accommodations, comfortable beds, and charming, uplifting decor. Walk just across a very quiet street, and you are right on the beautiful beach. There are beach towels, toys, and bikes kindly provided for your use. Disney was only a 35 min drive away, and Newport Beach has everything you might want in grocery stores and restaurants. The kitchen is one of the very best equipped for family meals , and there’s even a grill and fire pit in the beautiful backyard. We had the most delicious seafood at lovely restaurants just a walk or bike away from the house, and saw a seal and whales right from the beach. Anyone staying at this house will sense the loving care and spirit that was put into the house. We feel so lucky to have found such a gem. We just loved our stay at Kate's place! The location is 1 block from the water on the most gorgeous, quiet street. We made use of the front deck for eating lunch and also took the bikes out for a little tour of the area. SWOON. We even saw a whale right by the beach- seriously right in front of us. The home is FULLY stocked and even had games and movies that were perfect for our family (we have an 11 year old). We wish we could've stayed longer. Kate was extremely responsive and I left this experience feeling I've made a new friend! Thanks Kate!! The house was the perfect location for our family of 5. Kate is an amazing host who is very thoughtful. We look forward to staying there again. Our lovely home is located at the end of the charming Peninsula Point neighborhood. The beach is just steps away, but day trips are also fun - Disneyland, California Adventure, and Knott's Berry Farm are less than an hour away. Enjoy a day exploring Catalina Island! Quick drive to shopping at Fashion Island or Irvine Spectrum. Just a mile away at the Balboa Pier you can rent a kayak, jet skis, or parasail, or take the ferry over to quaint Balboa Island. So much to do in Orange County! Check-in is 3:00 pm, and check-out is 10:00 am.